Angela Mancini visits a Kindergarten class at Edward Murphy. KINDERGARTEN REGISTRATION: The EMSB has announced that Kindergarten Registration Week for the 2018-2019 academic year will take place from Monday, February 5 to Friday, February 9. If one child from a family is already enrolled in a particular school, a sibling registration period will take place a week earlier. Parents are asked to register at the EMSB elementary school nearest their residence offering the French program of their choice. For more information please call (514) 483-7200, extension EMSB (3672) or log on to the Board’s website at www.emsb.qc.ca. All pupils registering for the first time are required to provide a birth certificate and vaccination records to the school the child will be attending. Parents will be asked to fill out forms which will allow the school to apply for the certificate of eligibility for English schooling. Under the Charter of the French Language, a certificate of eligibility is generally granted to children who did the majority of their elementary or secondary studies in English in Canada; whose mother or father did the majority of his/her elementary studies in English in Canada or whose brother or sister did the majority of his/her elementary or secondary studies in English in Canada. As a result of language legislation, this criteria excludes studies completed in the Quebec Private School system. 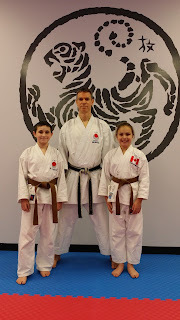 Left to right:Melanie Fernandes(PPO Parent), Lucas Arana (Gr. 6 Student), Uma Freeland Nardone (Gr.6 student), Kaya Gratton -Tally ( Gr. 4 student), Andrea Gratton (vice -Chair GB), Dorothy Ostrowicz( Principal). Sid Stevens (Sun Youth), Arlo Bagchi ( Gr. 2 student), Lisa Bagchi (PPO parent), Margaret Jegen ( Gr. 3 student- holding cheque), Katherine Quintana (PPO Parent), Rubens Ernest (Sun Youth ) and Jonathan Caisse (Sun Youth). 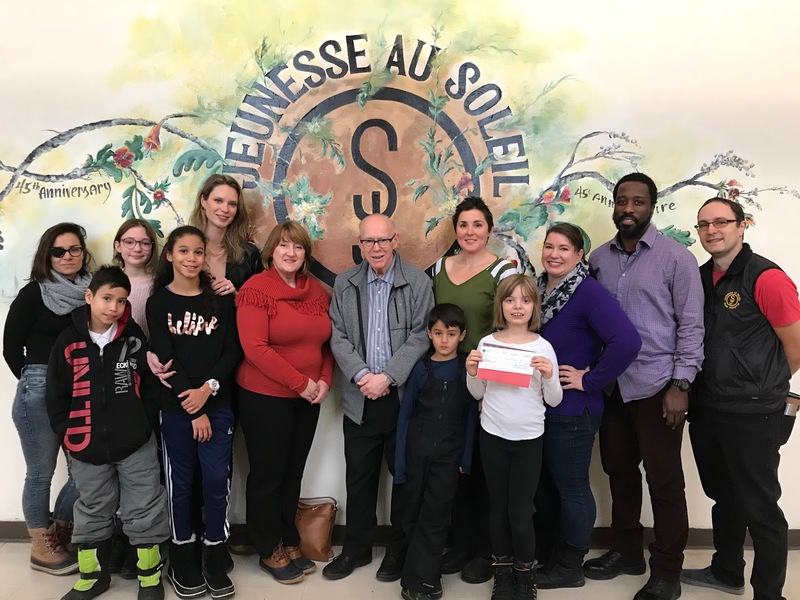 DONATION TO SUN YOUTH: Students at Bancroft Elementary School in the Plateau raised $1,200 and presented the Sun Youth Organization with a cheque on December 19. With the goal of giving the organization an early Christmas present, the students and parents at Bancroft School organized a number of fundraisers throughout the fall. In total, $2,400 was raised: half will be invested in the school and the other half donated to the Sun Youth Organization. See this report on Breakfast TV. MTA President Peter Sutherland, Chairman Angela Mancini and officials from both negotiating parties toast the new agreement. NEW COLLECTIVE AGREEMENT: The EMSB and the Montreal Teachers Association held a signing ceremony on December 18 to conclude a new three year local agreement (2017-2020). Vanessa joins students Etienne and Benjamin in the sensory room. VANESSA GRIMALDI GIVES BACK: Reality TV show star Vanessa Grimaldi was at Coronation Elementary School in Côte des Neiges on Wednesday, December 20 for a cheque presentation and ribbon cutting ceremony dedicated towards the building of four sensory rooms within the English Montreal School Board. Chairman Angela Mancini applauded the initiative. Vanessa presents a $50,000 cheque from her Foundation. ANNUAL REPORT AND SUCCESS PLAN: The 2016-17 EMSB annual report and success plans were adopted by the Council of Commissioners on December 20. They will be formally presented to the public at a special meeting on Thursday, January 11 (6:30 pm) at 6000 Fielding. Angela Mancini at press conference. CLASS ACTION SUIT: The five English and French school boards on the island of Montreal held a joint press conference on November 30 at John F. Kennedy High School in St. Michel. They did so to voice their concerns regarding an unbearable situation which jeopardizes the future of public schools and the students’ equal opportunity to succeed. 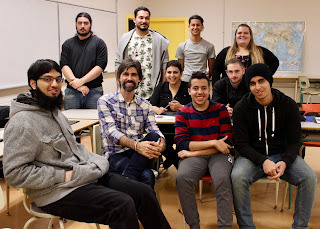 Together, they demanded a substantive debate on the scope of free education in Quebec society. According to their management, it is imperative to put the students’ needs back at the heart of the debate to facilitate their success in a vibrant and stimulating public school environment which reflects today’s society. Free education as defined by the Education Act is at the core of the problem. It stipulates that education services, textbooks and instructional material must be free, except for some categories of material and supplies which are not bound by this principle. See the press release. beloved grandchildren, Adrien and Benjamin, her sisters Jo-Ann (Martin) and Jean (Gordon), and her brother-in-law André. Jennifer is a teacher at Pierre Elliott Trudeau Elementary School. When the EMSB held a press conference last January to announce its plans for the STEAM program, Janice was invited to join us. She took in her daughter’s achievements with great pride. The family wishes to thank the oncology department at the Maisonneuve-Rosemont Hospital for their support during her illness. Memorial donations may be made to the Integrated Cancer Centre at Maisonneuve-Rosemont. ADDRESSING BULLYING: Julie René De Cotret and Daphna Leibovici from the EMSB Student Services Department were guests on Global TV’s Focus Montreal to discuss the topic of bullying with host Jamie Orchard. Here is the video coverage. 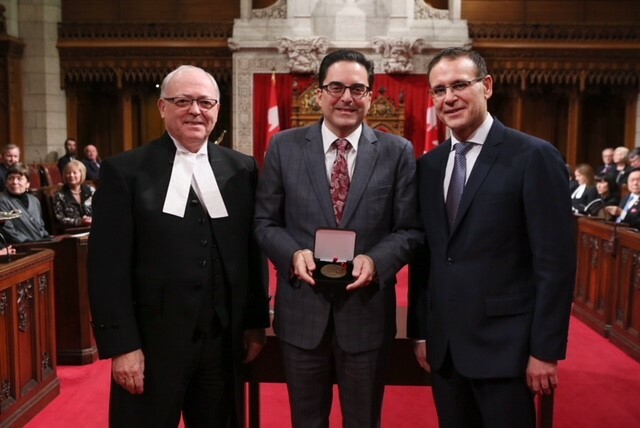 KATALIFOS HONOURED: Nicholas Katalifos, principal of Roslyn Elementary School in Westmount, was recently awarded the Senate of Canada Medal for public service in recognition of the Red Chamber’s 150th anniversary at a ceremony in the Senate Chamber in Ottawa. Senator Leo Housakos nominated Mr. Katalifos for the Medal. The award was presented to him by Senator Housakos and Speaker of the Senate of Canada, George Furey. Mr. Katalifos was recognized due to the outstanding service that he provides to Canada and Canadians, including his 27-yeear career in the field of education at the English Montreal School Board, his work in the Greek community, and his advocacy work providing better services to people with autism. George Furey, Nicholas Katalifos and Leo Housakos. Mr. Katalifos was previously the principal of Pierre de Coubertin and General Vanier elementary schools in St. Leonard and vice-principal of Gardenview Elementary School in St. Laurent and Westmount High School. He taught at LaurenHill Academy, and worked as a Community Liaison Officer for the Multicultural and Multiracial Division of the Community Services Department. As the chairman of Giant Steps School and Resource Centre, Mr. Katalifos is involved in their Inclusive City project. See the press release. 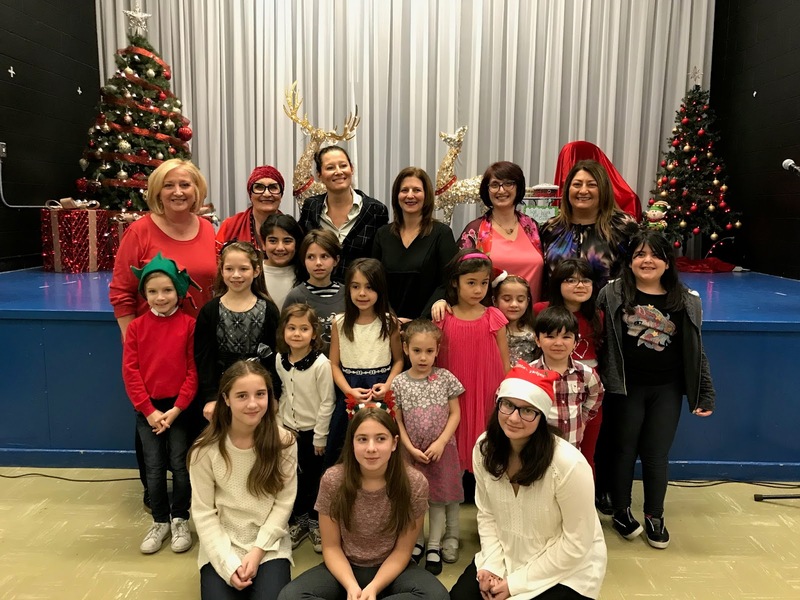 EDWARD MURPHY SCHOOL RECOGNIZED IN QUEBEC CITY: Recently, Edward Murphy School was recognized by Le Ministere de l’Education et la Famille as a finalist at the annual Ensemble Contre L’Intimadation Award Ceremony. The event took place at the National Assembly in Quebec City and served to honor individuals, organizations and schools that have stood out for initiatives that help prevent and fight bullying and intimidation. The school introduced their #WECARE program last year. This initiative is based on a social-emotional literacy program developed by Yale University’s Center for Emotional Intelligence. 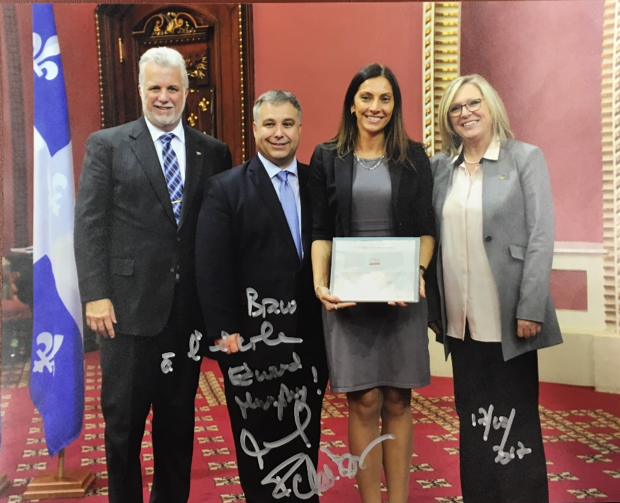 Edward Murphy School Principal, Cristina Celzi receives a certificate of recognition from the Premier of Quebec, Phillippe Couillard, as well as Francine Charbonneau, Minister responsible for Anti-Bullying and Sebastien Proulx, Minister of Education, Recreation and Sports. Commissioner Bernard Praw, Regional Director Pela Nickoletopoulos, Principal David Lee, Chair Angela Mancini, Mike Creamer, Mr. Creamer's wife Nadia, DG Ann Marie Matheson and Physical Education and Health Consultant Katherine Baker. 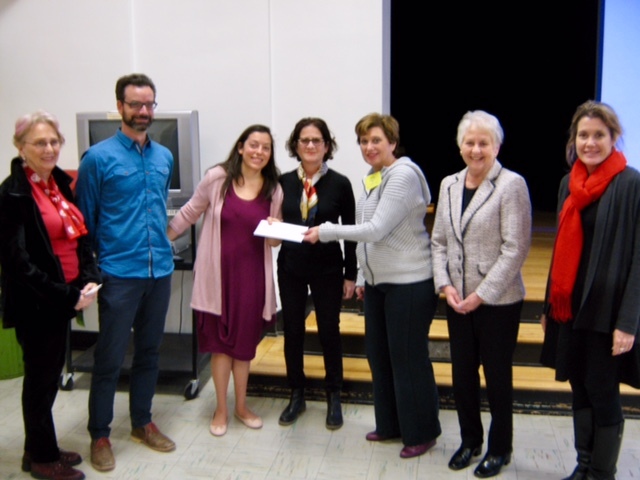 DOCTORS WITHOUT BORDERS: Students at Roslyn were captivated recently by a representative from Doctors Without Borders, who came to speak to the school about the organization and the work their volunteers perform in over 70 countries. Established in 1971, the mission of the non-governmental organization is to provide medical care in war-torn regions and developing countries. In 1999, the organization was awarded the Nobel Peace Prize. Sandra Leveille and Marc DeCrescentis with Angelo. ST. DOROTHY STUDENTS WIN HSBC AWARD: Angelo Varuzza, a student at St. Dorothy Elementary School in St. Michel, was recently presented with the HSBC Future Leaders Program Award. He was nominated for this award by the school and The Breakfast Club of Canada. HSBC has donated $1 million to support breakfast programs in five cities across Canada over three years. Angelo was one of seven recipients in Canada to receive an exciting recognition package designed to help support the student’s future education needs. This included a $1,000 credit to the HSBC High Rate Savings account in his name and an all-expenses paid trip to Toronto where astronaut Chris Hadfield was the guest speaker. Principal Sandra Leveille said that he chosen because his contributions have had a positive impact on both his school community as well as Montreal North. At school, Angelo is very helpful as he often volunteers to assist his teachers at recess around the classroom or the school. Angelo also donates his time at his parent’s bakery in Montreal North by taking on daily chores. In addition he also helps prepare meals for homeless people around his neighborhood. Childcare Worker Marco DeCrescentis nominated Angelo for the award. OUR LADY OF POMPEI STUDENT-TEACHER REUNION: Amanda Guedes loved her days as a student at Our Lady of Pompei Elementary School in Ahuntsic. Eleven years ago, her Grade 5 teacher was Athanasia Papamichelakis. Now in her third year at McGill University, completing a Bachelor’s of Education Degree, Amanda is a student teacher at Our Lady of Pompei. As luck would have it, she was assigned to work under Ms. Papamichelakis. “Throughout the course of my Grade 5 year, Ms. Papamichelakis had become my favorite elementary teacher,” Amanda recalls. “She was always so full of energy, made us laugh, and made us feel as more than just her students. She was an amazing teacher; always organized, on top of everything, and ready for any problems that may arise. I aspired to be that kind of teacher when I got older and I had a role model of one right in front of me! Now, eleven years later, I had the amazing opportunity to be Ms. Papamichelakis' student teacher for three months. EDWARD MURPHY STUDENTS ENJOY THE NUTCRACKER: Dreams came true and lifelong memories were made when all of the Cycle 1 students from Edward Murphy School were fortunate enough to attend Les Grands Ballets Canadiens' presentation of "The Nutcracker." In collaboration with Une école Montréalaise pour Tous, the students took part in a series of three in-school sewing and costume design workshops, in which they created the Snow Queen's costume from "The Nutcracker". 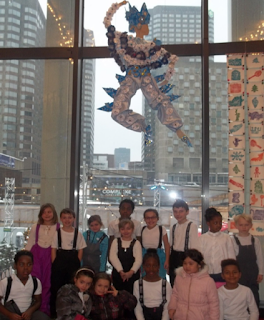 They were able to see their costume on display at the entrance of Place des Arts. The costume will be on display throughout the run of "The Nutcracker", this holiday season. Spreading joy at Edward Murphy. TWELVE DAYS OF HOLIDAY JOY: To mark 12 days before Christmas, students from Edward Murphy School in Hochelaga-Maisonneuve started spreading 12 days of holiday joy. Their first stop was Les Jouets de Noel where they rolled up their sleeves and got to work checking gently used and new toy donations in order to make sure that they were suitable to be given as gifts to Montreal's children in need. The students volunteered two hours of their time, knowing that they would be bringing a smile to the faces of other children. 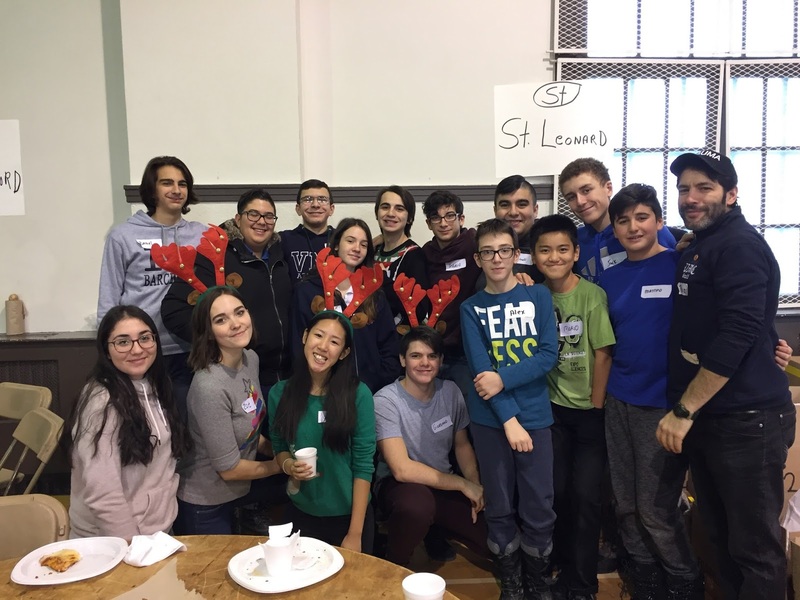 Other activities included Christmas caroling for the Canadian Forces and local law enforcement, creating and delivering of holiday cards to senior citizens as well as other volunteering in the community. A big thank you to Mr. Spencer from Les Jouets de Noel and Edward Murphy teachers: Ms. Stacey, Ms. Anna, Ms. Dominique. Ms. Melissa and Principal Cristina Celzi, for making this experience possible. EMSB officials join the Rosemount High Band at Gerald McShane. 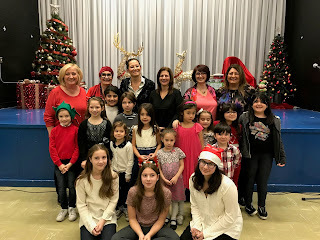 GERALD McSHANE CHRISTMAS BREAKFAST: The annual Generations Foundation Christmas Breakfast took place this year at Gerald McShane Elementary School in Montreal North. Santa Claus made an appearance and the Rosemount High School Band performed. 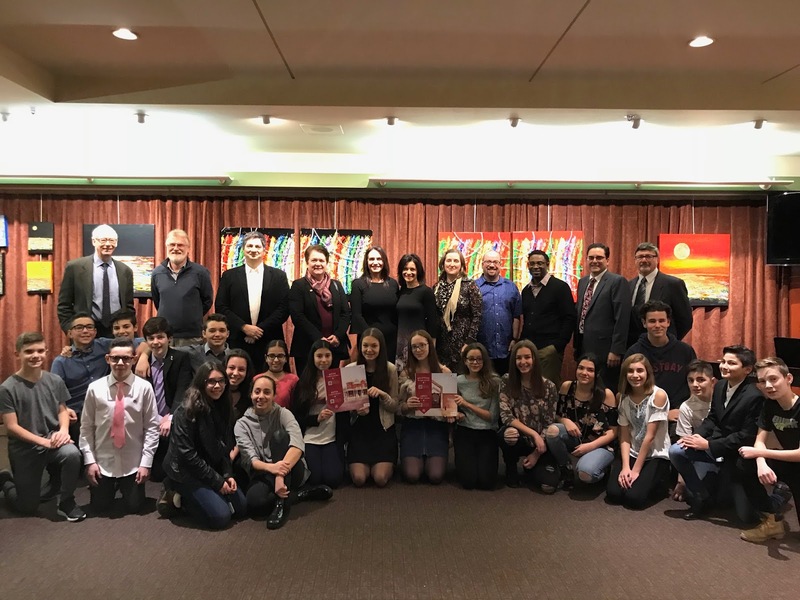 EMSB Director General Ann Marie Matheson, Deputy Director General Benoit Duheme, Vice-Chair Sylvia Lo Bianco and Regional Directors Evelyn Alfonsi and Pela Nickelotopoulos were among those on hand as well as Generations Foundation directors Adrian and Nathalie Bercovici. See our photo album And see this Global TV report. VERNISSAGE AT JAMES LYNG: Students from James Lyng High School in St. Henri have been collecting real-life stories from residents of the South West neighbourhoods of Montreal. These are: St-Henri, Little Burgundy, Pointe-St-Charles, Ville-Emard and Verdun. Individuals range from long-time residents to new locals. The diverse scope of perspectives shared through Lives of the South West are both personal and profound. Storytellers include world-renowned jazz pianist Oliver Jones, actor and playwright Vittorio Rossi, rapper Nate Husser, New Regine-founder Setiz Taheri and many more. Using these stories, the students have created a multi-media exhibition in the school’s art gallery, as well as an interactive online map which will be available at www.livesofthesouthwest.com after December 21. The school invites the public to join us as they journey through the lives, neighborhoods, history and richness of the South West. The Up Next Gallery opened in December of 2015 as part of the school’s transformation into an “Urban Arts High School.” The gallery is run by students and showcases the work of our own students, youth from other schools, community groups and professional artists. A vernissage for the exhibition will take place on Thursday, December 21 (6:30-8:30 pm) at the Up Next Gallery at the school (5440 rue Notre-Dame O). The event is open to the public. Please see this excellent story by Bill Brownstein in The Montreal Gazette. FACE STUDENTS WORKING TOGETHER: Over 200 students from both the English and French sectors at FACE School (3449 University) in Downtown Montreal will unveil their interpretations of “The Four Seasons” on January 16 (4 pm). The theme of the Four Seasons was chosen as it allows the students to think about the world around them. The project asks the students to reflect on the seasons of life and to design a mosaic panel based on this. Judges will select the four best projects. Winning designs will subsequently be displayed at the Saint-Louis Square fountain in the Plateau (May 2018). Set to judge the designs on January 16 are: Luc Ferrandez, Mayor of Le Plateau-Mont Royal Borough; Annie Lamarre, Principal of FACE School; and Konstatine Veliovitch, the FACE artist in residence. Simone Nichol is the teacher spearheading the project. Community Day at John Caboto. 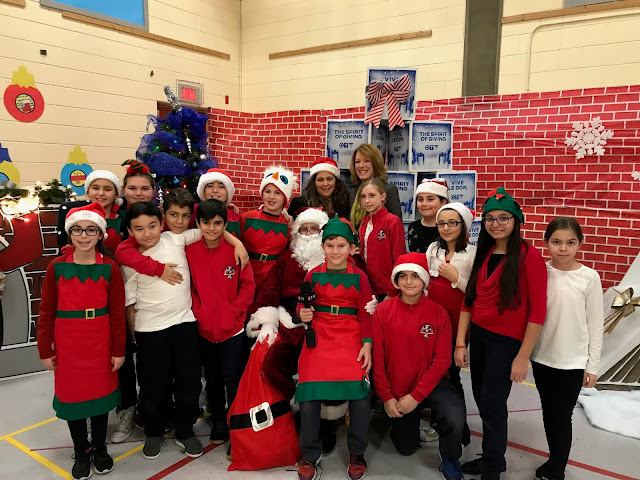 COMMUNITY DAY: John Caboto Academy in Ahunstic held their 11th annual Community Day recently, welcoming local families for a day of activities and celebrations to kick off the holiday season. Since 2006, local families have looked forward to the popular activities such as arts and crafts and reptile zoo as well as the chance to take professional family portraits and even spend some time with Santa. The event is always free, but the school uses the day as a way to collect non-perishable goods for the EMSB’s Spirit of Giving campaigns as well as monetary donations for the Telethon of Stars. MACKAY CENTRE: Construction on a state-of-the-art facility for the Mackay Centre and Philip E. Layton Schools is well under way. The facility is being built on land located on Terrebonne Street, between Benny and Madison Avenues, in NDG. The EMSB has owned the green space for decades. The field was under municipal custodianship and was being used as an informal playing field by the public and the neighbouring Commission scolaire de Montréal (CSDM) elementary school École Marc-Favreau. To date, construction is more than 30 percent complete, with the heaviest work almost finished. The building’s underground infrastructure and structure are up. The current work of closing up exterior walls, installing precast concrete panels and curtain walls, will be complete shortly. Inside concrete slabs are 80 percent up, and will be completed in early January. Electrical work, plumbing, ventilation duct work, and interior walls, are being worked on, with a large portion of the work on both first and second floors in progress. The outside infrastructure drainage system is partially completed, with an anticipated finish date in the spring. The interior work will be conducted in the winter, while landscaping will begin in the early spring. Roofing dividers and membranes, and parapets are being installed. Vapor barrier, insulation and waterproofing will be completed by the end of January. The new school will house approximately 200 students with developmental, intellectual, auditory or visual impairments and will be the only one of its kind to offer specialized educational and rehabilitative services for the Anglophone community. Its supra-regional mandate means that students from all nine Quebec English school boards will be eligible to attend this school. Some students must by travel as much as three hours per day by school bus. 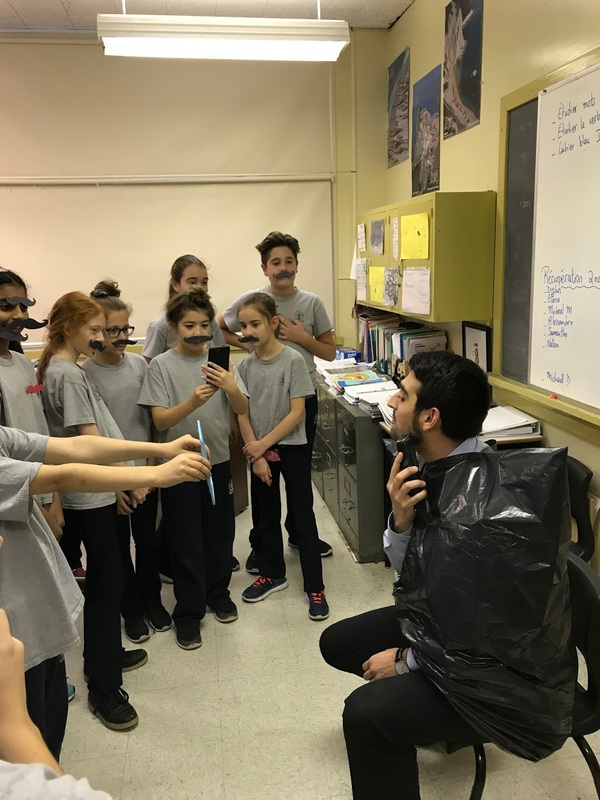 MOVEMBER AT GARDENVIEW: Like many other schools, Gardenview participated in the month-long awareness campaign of Movember and raised awareness about some of the biggest health issues faced by men: prostate cancer, testicular cancer, and poor mental health. It started with Vice-Principal Gaetano Sifoni (right), shaving off his beard live from a Grade 6 classroom and throughout the month, he and Gardenview teachers, Souren Beylerian and Paul Hammett, grew moustaches to get young people and their parents talking and asking questions about these important issues. In total, the Gardenview community raised close to $1,800 for the Movember foundation. 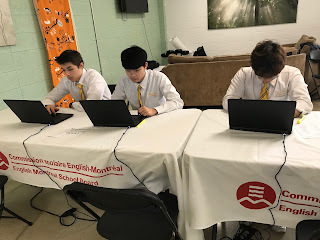 HONORE MERCIER PODCASTS: Students at Honoré Mercier Elementary School in St. Leonard were pretty busy during the first half of the school year, recording nine tri-lingual (English, French & Italian) podcasts about St. Léonard's most famous landmarks. From Cafe Milano - Montreal to the Caverne de St. Léonard, plaques will soon be placed in front of these famous locations with #QRCodes, which visitors can scan with their smart phone to listen. PLAY IT FAIR: The EMSB’s B.A.S.E. Daycare program and Spiritual Animation Service were honoured recently with the Equitas International Centre for Human Rights Education Play it Fair award. Annually, Equitas acknowledges a Canadian organization, school or municipality with an award that promotes the advancement of human rights education. The presentation of the award coincides with National Child Day in November. The EMSB was chosen for its Supporting Children as Leaders through Play it Fair! initiative. This program is offered in 14 B.A.S.E. daycares and engages over 160 high school students via the Spiritual and Community Animation Service. Examples of activities at EMSB schools include: videos and movie trailers on what safe and respectful places look like, a photo exhibit on children’s rights, murals in schools to welcome children, a story book on the environment and anti-bullying games. See our press release. 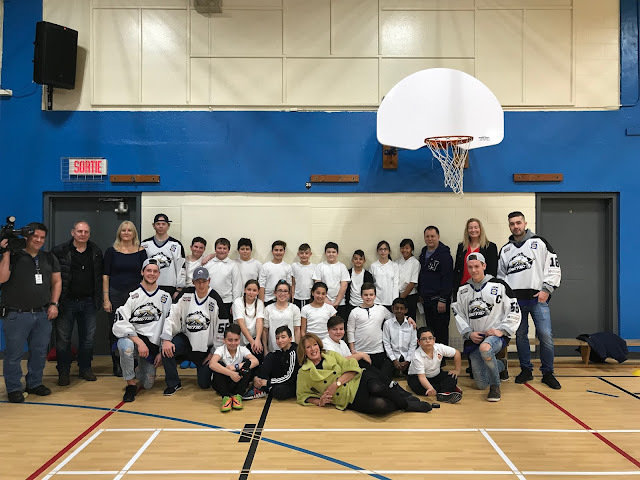 KAYLA SEGAL GRANTS: Sinclair Laird Elementary School in Park Extension and Cedarcrest Elementary School in St. Laurent are the first recipients of The Kayla Segal Sports and Wellness Grant. They have each received $875 that will be applied towards helping their students live more active lifestyles. 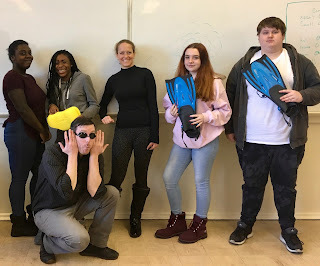 For Venture High School in Ville Émard, Kayla collected bathing suits, goggles, bathing caps, a couple of bags and some swimming paddles, as well as fins. The swimming gear will be used at the pool next door to the school. The students have not used it as of yet because they did not have the equipment and many could not afford to make the purchase; they are looking very forward to swimming! Professionally, Segal is a Financial Security Advisor and she focuses on helping people find optimal life, health and disability insurance solutions. Her passion remains competing in marathons and triathlons across the world. In order to support health and wellness programs in the EMSB, she embarked on an initiative to offer grants to two schools. Various fundraising activities were undertaken in order to raise the money, and she wants to thank everyone who helped in the process. Kayla Segal drops by Venture to hand out gifts. LaurenHill Acdemy Junior Campus students pack their boxes. 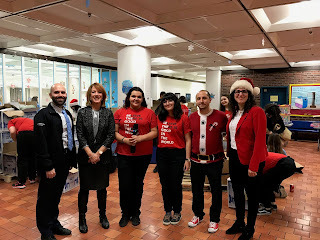 SPIRIT OF GIVING: In preparation for the holidays, the EMSB once again teamed up with the Canadian Armed Forces to support CTV Montreal’s annual “Spirit of Giving” campaign, which brings much needed assistance to the less fortunate throughout Montreal. More than 40 schools and centres took part in the campaign, as well as some community organizations. CTV's Christine Long with Michelangelo International Princpal Marissa Mineiro, students and Santa. Lester B. Pearson High School in Montreal North and LaurenHill Academy in St. Laurent served as the depots and main hubs for the campaign. 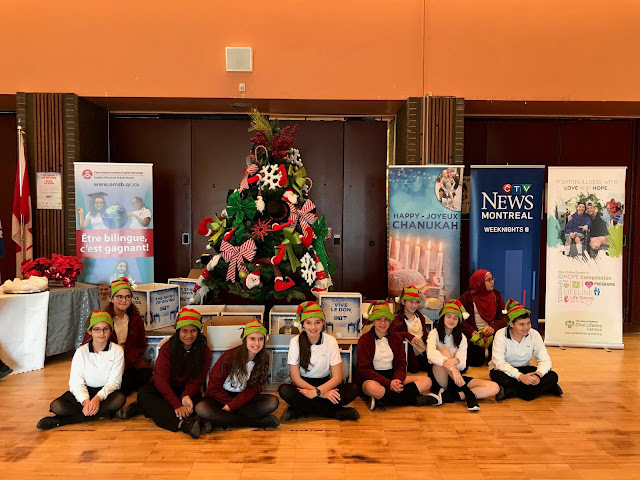 Many of the participating EMSB schools organized a series of events set to encourage donations, and a number of schools were featured on CTV Montreal’s mid-day and nightly news programs throughout the duration of the campaign. Here is a video which recaps the highlights of all the CTV broadcasts. If you click on the names of the schools below you can see the full reports. Lester B. Pearson High School wraps things up. The campaign began with a live broadcast from LaurenHill Academy on December 6 and concluded with a live broadcast from Lester B. Pearson High School on December 14. Here is a second clip. Other schools featured were Roslyn in Westmount, Coronation in Côte des Neiges, Gerald McShane in Montreal North and Michelangelo in RDP. TOY TEA SUCCESS: Twenty-three participating schools managed to collect over 2,000 new toys for the 26th annual Christmas and Chanukah Toy Tea, which was held on December 6 in the Oval Room of the historic Ritz Carlton Hotel in downtown Montreal. 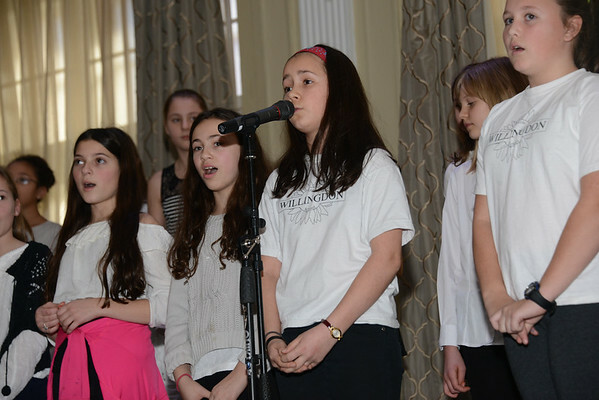 Willingdon students perform at the Toy Tea. These non-violent toys will benefit more than 5,000 children who are living in 31 shelters for domestic abuse and violence, and those who benefit from other charities such as the Welcome Hall Mission, the Montreal Diet Dispensary, Tyndale St. Georges Parish, St. Willebrord’s Parish and La Rue des Femmes. This is the fifteenth year of the English Montreal School Board’s (EMSB) involvement in the Toy Tea Campaign, which is organized under the direction of Guidance and Spiritual Community Animation Education Consultant Frank Lofeodo. The St. Dorothy Choir performs. The participating EMSB schools were: Willingdon, Mackay Centre School/Philip E. Layton, FOCUS Alternative High School and Royal Vale School in N.D.G. ; LaurenHill Academy Junior Campus, Gardenview School and Parkdale School in St. Laurent; Vincent Massey Collegiate in Rosemount; Dunrae Gardens School and Carlyle School in T.M.R. ; John F. Kennedy High School in St. Michel; St. Dorothy School in St. Michel; St. Gabriel School in Pointe St. Charles; Edinburgh School in Montreal West; Sinclair Laird School in Park Extension; Honoré Mercier School and John Paul I Junior High School in St. Leonard; Rosemount Technology Centre; Bancroft School in Plateau Mont-Royal; and Westmount Park School. Student representatives from each school, along with their respective spiritual community animators, teachers, administrators and parent volunteers, attended the event to drop off their unwrapped donated toys and receive special certificates of participation from Erika Ludwick, the Toy Tea’s chairperson. The event also featured the singing of Christmas carols by several private school choirs. 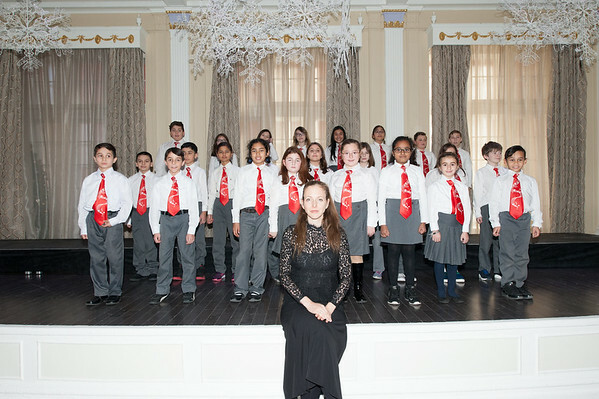 Attendees were also treated to performances by the Willingdon, St. Dorothy and Westmount Park school choirs under the direction of, respectively, Nick Batzios, Caroline Derome and Giovanni Ruccolo. See photo album. Chris Nilan with Alex's family and some students. DANCE FOR ALEX: Alex Porter-Rozmovits was a bright, loving and thriving six year old Royal Vale kindergarten student. Alex died suddenly on June 22, 2009 of a rare bacterial infection. His parents and his sisters Abby and Olivia miss him every day. Teacher Mme. Yasmine noticed how he enjoyed dancing with his friends and with her. Royal Vale School (RVS) has hosted the “Dance for Alex” since 2010 in his memory. Every December, elementary school students, teachers and parents gather in the gym to dance and remember their fellow student. This year, Alex’s parents took the opportunity to give back to the community and raised over $8,000 in honour of RVS, Alex and the Montreal Canadiens Children’s Foundation (MCCF). Funds raised will be divided equally between RVS and MCCF. Chris Nilan, a former member of the Canadiens and a present-day host on TSN 690 Radio, was a special guest. He spoke to the students, signed autographs and even danced. Left to right Rena Entus, Aaron Prosser, Nathalie Malhame, Wendy Cryer Frank, Mindy Spiegel, Barb Angus and Nathalie Lacroix. 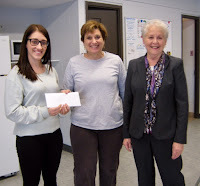 Meanwhile, Mindy and Barb also presented the award to Melanie Mercantile (right), pre-school teacher at Gerald McShane Elementary School in Montreal North. Melanie's project focuses on learning through play. The grant will allow her to buy additional play materials for her students. VMC WORKS WITH COMMUNITY: Students at Vincent Massey Collegiate in Rosemount focused on the “Three S’” before the holidays: socks, shoes and sandwiches. Working with community groups, such as the Knights of Columbus, Cents Of Hope as well as Our Lady of Pompeii Elementary School in St. Michel, they created personalized care packages containing the new socks, shoes, hygiene products and holiday wishes for the season. Volunteering at the food bank. It was a real team effort between JFK High School and L.I.N.K.S. MENTORING THROUGH BASKETBALL: Students at John F. Kennedy High School in St. Michel recently welcomed their peers from Literacy Independence Networking Knowledge Success (L.I.N.K.S.) High School in Ahuntsic for a day of camaraderie and basketball. For the first time, these two schools collaborated, allowing students from L.I.N.K.S. to participate in a basketball-centric leadership and mentoring project. Over the course of one day, the students from L.I.N.K.S. worked one-on-one with JFK’s male and female student-athletes. For their guests from L.I.N.K.S., the student-athletes were an inspiration, sharing their passion, knowledge and skills. Together, the students worked on a number of drills, shared a meal and watched a game. To cap off a perfect day, JFK students presented their peers with a new game ball, practice jerseys and school t-shirts. The L.I.N.K.S. students left motivated to improve their skills and are eager to return in the future to demonstrate their progress. L.I.N.K.S. is an alternative high school providing quality educational programs to students from 13 to 21 years of age who have been diagnosed with learning difficulties. Rosemount High School students proudly display their sock collection. 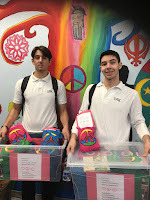 SOCKS IN A BOX: Congratulations to students from Rosemount High School and Nesbitt Elementary School in Rosemount as well as Dalkeith Elementary School in Anjou collected 4,500 pairs of socks to donate to homeless shelters across Montreal. Meanwhile, the students and staff at Roslyn Elementary School in Westmount collected over 3,200 pairs of socks for homeless shelters across Montreal. See this report on Breakfast TV. CPR AT ROSEMOUNT: CTV News was at Rosemount High School last week to broadcast students practicing CPR in the background. The school offers a babysitting CPR certification through its athletic leadership program. This holiday season, our hearts were particularly warmed by the staff and students of Willingdon Elementary School, who collected warm socks and also handcrafted hundreds of Christmas cards to give to our clients. I’d like to thank producer Jake Kent and his talented team, for capturing this touching moment on video. On behalf of everyone at the Old Brewery Mission, I wish to extend my deepest gratitude for your commitment to ending chronic homelessness with us. Best wishes to all for a joy-filled holiday season, and a New Year of peace and goodwill. See this video about Willingdon's efforts. THE GOAL: Andrew Caddell’s self published book The Goal, which he co-wrote with local journalist Dave Stubbs in 2015, has been picked up by Rock Mills Press and reproduced with four new short stories, many more pictures and in colour. 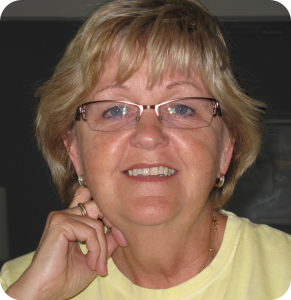 The Montreal West native has been a reporter and broadcaster in Montreal, Ottawa, Calgary, St. John’s and Geneva, Switzerland. He recently retired from the Department of Foreign Affairs and once worked for the United Nation. He recently spoke to teacher Allie Holloway's Secondary IV English class, an eager group of students who love to write. Andrew Caddell presents a copy of his book to the Royal West Academy Library. Later Principal Tony Pita invited Mr. Caddell, who attended elementary and high school in the same building decades ago, to speak to students who were involved in an elaborate United Nations debate. 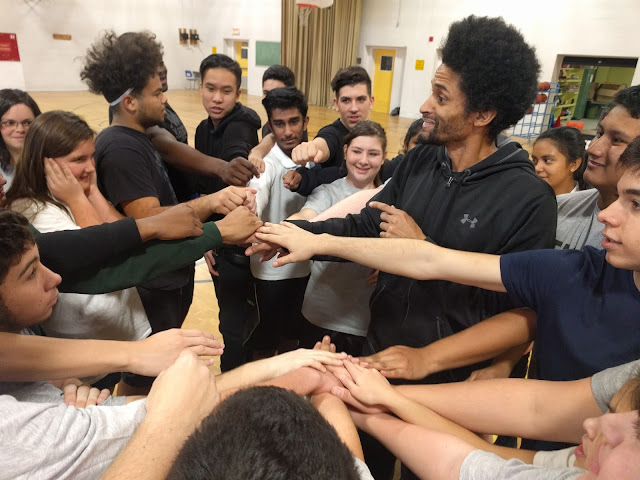 THE LLOYD BARKER TOUR: Former Montreal Impact team MVP, league All-Star and Assistant coach, Lloyd Barker is available to visit schools as a motivational speaker. His talks are geared towards students aged eight and up. Lloyd's presentations combine motivational topics (perseverance, appreciation, life-lessons), with an emphasis on the importance of staying in school, as well as training and wellness tips. The duration is between 60 and 75 minutes, and includes an autograph session opportunity at the end. He suggests that schools combine the classes into one big group and assemble in the gymnasium for the presentation. Mornings are preferential. It should be noted, Lloyd's presentation and format is similar to the one he spearheaded with the Montreal Impact when they launched their stay in school program back in 2006. He was the lead speaker for six years and it was an extremely well received program. There is no cost for Lloyd’s talk. He is asking that the school allows him to distribute flyers for his new soccer academy to students in attendance who might be interested. Lloyd's professional career began at the young age of 17 years when he signed his first pro contract with the Ottawa Intrepid of the Canadian Soccer League (CSL). Along with playing for the Jamaican National Team, Lloyd also played 10 seasons with the Montreal Impact. Since then, he has been involved in the game at every level in North America and is now one of Canada's most respected soccer minds. Lloyd's extensive playing, coaching and broadcasting experience, has provided him with a high level of knowledge that is not matched by many in Canada. Thus far he has enjoyed very successful visits to two elementary schools – Roslyn in Westmount and Honoré-Mercier in St. Léonard. You can find out more about his academy at www.best11academy.com. Lloyd can be reached at lloydbarker11@yahoo.com. GREAT WAR EDUCATION PROJECT: Last year The Royal Montreal Regiment Museum started collaborating with Chantal Clabrough (a teacher at Westmount High) to create materials to teach about the First World War to Secondary IV and V students. The result of this co-creation between the Museum and a dynamic educator is the Great War Education Project, a series of five independent units, each comprised of a turnkey teacher and student guides, some with an accompanying presentation (https://rmrmuseum.com/educational-resources/). To complement those units, workshops have been created so that teachers can invite the museum staff in their classroom to lead a hands-on activity featuring artifacts from the Museum’s collection (https://rmrmuseum.com/museum-activities). The idea behind this whole project is to provide an opportunity to question history through stimulating projects and anchor Montreal’s and Westmount’s local history in the broader scope of a global conflict whose legacy is still relevant today. STUDENT SERVICES UPDATE: The EMSB Student Services Department welcomes psychiatrist Dr. Anthony Gifuni to the team He will provide in-school consultation services as well as consultation services to EMSB psychologists and guidance counsellors. In light of the significant increase in the number of students exhibiting severe behavioural difficulties, anxiety, depressive or eating disorders, self-harming or disruptive behaviours, suicidal tendencies, etc, the Student Services Department felt it timely and important, to bring a psychiatrist on board. Dr. Gifuni, who will be available for up to a maximum of 10 hours per month, is currently serving as a psychiatric consultant at Concordia University and is conducting research at the Douglas Hospital. All EMSB principals have been sent an in-school Psychiatric Consultation Referral Form. Psychologists and guidance counsellors, in collaboration with their respective school principals, are invited to submit a referral form when they require a consult with Dr. Gifuni. He will meet with the team in question and offer support and guidance on how best to care for the student in question. All requests for service will be examined and prioritized based on the severity and urgency of the presenting problem. Completed referral forms can be sent to Lew Lewis, Director, Student Services Department at llewis@emsb.qc.ca. For further information contact Lew at 7308. PROFESSIONAL DEVELOPMENT: The Educational and Technology Services Department (ETS) presented many opportunities for professional development to all the youth sector teachers during the months of October and November. Every Friday in October was dedicated to the traditional October “à la carte” Ped Days. This meant that teachers were able to choose two workshops from over 40 that were offered each day. 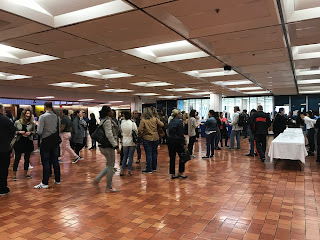 On October 6 and 13, ETS welcomed the teachers of the East Sector, first elementary and then secondary, at Lester B Pearson High School. On October 20, Marymount Academy International was the location of the workshops for the elementary West Sector teachers. Finally, the last of these Ped Days, on October 27, was hosted by LaurenHill Academy for secondary teachers of the West Sector. There were between 300 to 450 teachers in attendance on each one of the days. Also in attendance were in-school administrators and board administrators. Staff gather at Lester B. Pearson High School. In November, the ETS Department focused on the first part of Common Formative Assessment. Six training days were organized by sector, by level and by subject area. The training took place in various schools and conference centres and the days were met with much appreciation from the participants who felt it was relevant and efficient. The presenters were our subject specific consultants who will also be presenting the second part of Common Formative Assessment in March and April 2018. CPAC ROUTE 338: CPAC, the Parliamentary TV channel, has launched a new literacy initiative. CPAC Route 338 is an innovative resource which provides a virtual trip across Canada allowing Internet users to learn more about our political history, the functioning of Parliament, the role of their representatives and the importance of citizens’ political participation. This democratic literacy project has three key components: The Route 338 website, which profiles and showcases all of Canada’s 338 federal ridings through photos, fast facts and videos from CPAC’s extensive archives; a series of giant floor maps detailing Canada’s 338 ridings, developed in partnership with the Royal Canadian Geographical Society; and a series of 11 curriculum-linked learning activities designed to help teach students from primary to senior levels about the many facets of a democratic society. You can see the website by following this link of Route 338. Teachers can reserve the Giant Floor Map by clicking on this address: education.canadiangeographic.ca. It was a successful Bingo Night. HECHT SCHOLARSHIPS: Applications are now being accepted for the Riva and Thomas O Hecht Scholarship, Teaching of the Holocaust for Educators, for the 2018 summer session. This year, four scholarships to the Belfer Conference in Washington D.C. will be provided. These two three-day conferences will take place between July 23- and 28. Here is the application. Ann Marie Matheson, Rosario Ortona and Angela Mancini learn about the automobile mechanics program. 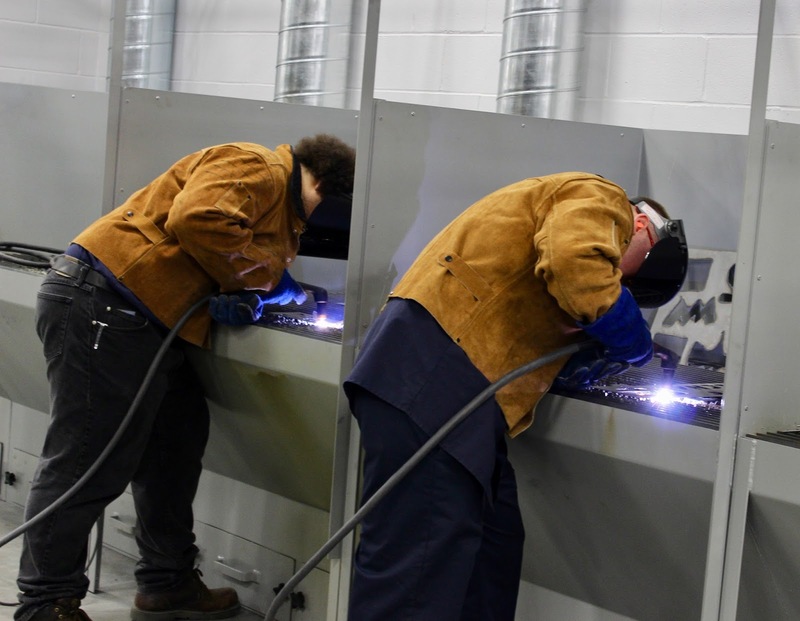 NEW CENTRE: The EMSB marked the opening of a new vocational training facility that specializes in Welding & Fitting and Automobile Mechanics on November 3 in St. Leonard. EMSB Chairman Angela Mancini credited the professionals of the board’s Adult Education and Vocational Services Department for their vision and commitment to offering the best vocational education to students. EMSB professionals who contributed to the successful completion of this two-year long project recognized were Cosmo Della Rocca, regional director for Adult and Vocational Education; Daniel Hogue, director of Material Resources and project manager; Mario Argiropoulos, assistant director of Vocational Education, who took on a special leadership role as assistant project manager; Lino Buttino, principal of Laurier Macdonald Vocational Centre; Harry Michalopoulos, principal of Rosemount Technology Centre; Sulaman Khan, vice-principal of the new Des Grandes Prairies facility; Frank Di Tirro, teacher and program coordinator for the Automobile Mechanics program; and Robert Martin, teacher for the Welding & Fitting program. Officials in attendance included: Sylvia Lo Bianco, vice-chairman and commissioner for Ahuntsic, Montreal North; Me Patricia Lattanzio, city councillor and commissioner for St. Leonard; Rosario Ortona, chairman of the AEVS Advisory Committee and commissioner for Anjou, Mercier, Hochelaga-Maisonneuve, Rosemont-La Petite-Patrie; Me Joe Ortona, commissioner for Rivière-des-Prairies, Pointe-aux Trembles; Mordecai Antal, commissioner for Côte-des-Neiges, Snowdon, Outremont, Mount-Royal, Park Extension; Joseph Lalla, commissioner for Montreal West, Notre-Dame-de-Grace; Julien Feldman, commissioner for Westmount, Sud-Ouest, Ville-Marie West; Bernard Praw, commissioner for Hampstead, Côte Saint-Luc; James Kromida, commissioner for Saint Laurent; Agostino Cannavino, commissioner for St-Michel, Villeray, Plateau Mont Royal, Ville-Marie East; Mario Bentrovato, parent commissioner, secondary schools; Joanne Charron, parent commissioner-ACSES; Norm Gharibian, parent commissioner; Jason Trudeau, parent commissioner–elementary schools; Lisa Christensen, city councillor for Rivière des Prairies; Director General Ann Marie Matheson; Deputy Director General Benoît Duhême; and Regional Directors Pela Nickoletopoulos and Evelyne Alfonsi. See the complete press release here. See the photo album here. PIUS REACHES OUT: Chef Derek Curzi and some of his students from St. Pius X Career Centre organized and prepared over 600 meals for the less fortunate. 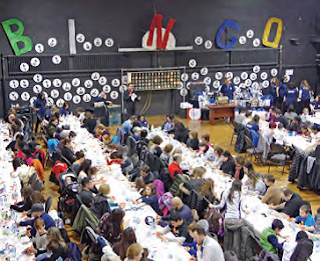 On December 10, hundreds gathered at Marché Bonsecours, in Old Montreal to enjoy the delicious meals prepared by Pius students and their chef instructor. Father John Walsh holds this event every year, and this was the third in which the Pius Culinary Institute was happy to lend a hand to those in need. 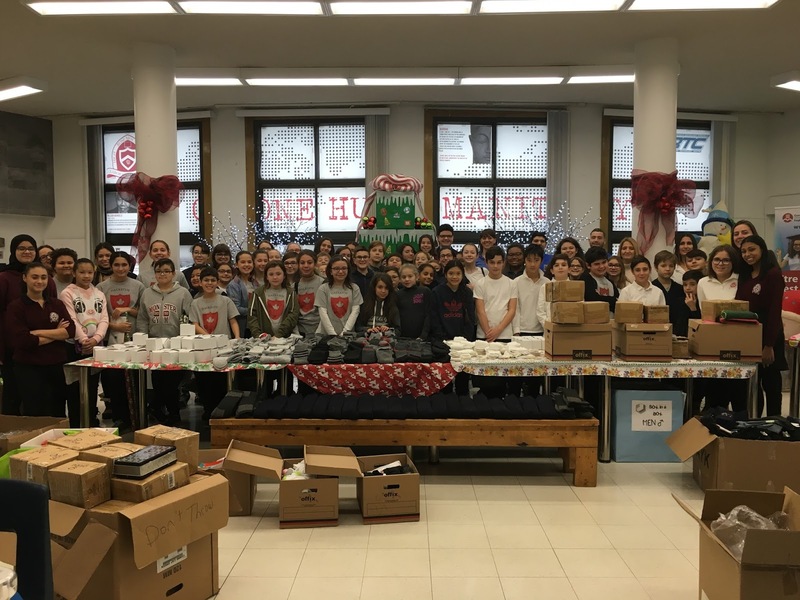 The holiday season sparks in everyone the desire to extend warmth and kindness, especially to those facing hardship, and the community at Pius is always happy to do its share. JFK ADULT CENTRE PROFILE: John F. Kennedy Adult Education Centre (JFKAC) in St. Michel has introduced an enriching twist to the academic experience with some unique option courses. In addition to the traditional courses of English French as a Second Language, math, sciences and history, Principal Elizabeth Lagodich and Vice-Principal Darlene Kehyayan are striving to make adult education at JFK supportive and holistic, fostering an environment that provides students with every opportunity to succeed. They take a personal approach to issues that arise, and keep students connected to the school and to themselves. This fall, an Outdoor Education course took learning beyond the classroom. Building Resilience offers students ways to find balance in their lives. New meditation and mindfulness workshops provide students the space to explore self-awareness and in turn, enhance their learning experience. Students can learn 3D animation, Photoshop, Excel and other skills in computer lab courses On-site tutoring for French, math, and science is available. JFKAC is proud of their Social Integrations Services (SIS) students. The course offerings for SIS include pet therapy, with a certified dog from St. John’s Ambulance, and music therapy. A new TED talk concept lunch series “Just for Knowledge” will begin in the New Year. See the full press release. For more information about the school log on to http://www.jfkac.ca or call 514-374-2888. ACTION COLLECTIVE : Les cinq commissions scolaires de l’île de Montréal, francophones et anglophones, ont tenu une conférence de presse conjointe le 30 novembre à l’école secondaire John F. Kennedy à Saint-Michel pour sonner l’alarme quant à une situation intenable qui compromet l’avenir de l’école publique et l’égalité des chances de réussir pour les élèves. Ensemble, elles ont réclamé un débat de fond au sujet de la portée de la gratuité scolaire dans la société québécoise. Selon leurs dirigeants, il est urgent de remettre les besoins des élèves au centre du débat pour faciliter leur réussite dans une école publique vivante, stimulante et à l’image de notre société d’aujourd’hui. La gratuité scolaire telle que définie par la Loi sur l’instruction publique est au cœur du problème. Cette loi prévoit que les services éducatifs ainsi que les manuels et le matériel didactique, doivent être gratuits, à l’exception de certaines catégories de matériel et d’objets qui échappent à ce principe. Nous vous invitons à consulter le communiqué. IN MEMORIAM : Janice Lacroix, ex-conseillère en communication à la CSEM bien-aimée de tous, est décédée le 30 novembre à l’Hôpital Maisonneuve-Rosemont. Elle laissera sans contredit un grand vide autour d’elle. Janice laisse dans le deuil son époux Robert Lacroix, ses enfants Robert (Joanne) et Jennifer (Oreste), ses petits-enfants Adrien et Benjamin, ses sœurs Jo-Ann (Martin) et Jean (Gordon), ainsi que son beau-frère André. Sa fille Jennifer est enseignante à l’école primaire Pierre Elliott Trudeau. Janice avait été invitée à assister à la conférence de presse organisée par la CSEM en janvier dernier pour dévoiler son initiative STIAM. Elle était très fière des réalisations de Jennifer. La famille tient à remercier le département d’oncologie de l’Hôpital Maisonneuve-Rosemont pour son appui tout au long de la maladie de Janice. Des dons commémoratifs peuvent être versés au Centre intégré de cancérologie de Maisonneuve-Rosemont. INTIMIDATION : Julie René de Cotret et Daphna Leibovici des Services aux élèves de la CSEM ont été les invitées du segment Focus Montreal de Global TV afin de parler d’intimidation avec Jamie Orchard. Nous vous invitons à visionner la vidéo. DES HONNEURS POUR M. KATALIFOS: Nicholas Katalifos, directeur de l’école primaire Roslyn à Westmount, s’est vu remettre récemment la médaille du 150e anniversaire du Sénat du Canada pour ses services publics, lors d’une cérémonie à la Chambre du Sénat à Ottawa. Le sénateur Leo Housakos a soumis la candidature de M. Katalifos pour la médaille du Sénat du Canada dans le cadre du 150e anniversaire du Sénat. Cet honneur lui a été remis par le sénateur Housakos et le président du Sénat du Canada, M. George Furey. M. Katalifos a été honoré en reconnaissance de ses services exceptionnels au pays et à l’endroit des Canadiennes et Canadiens, notamment ses 27 années de carrière dans le domaine de l’éducation à la Commission scolaire English-Montréal, son implication au sein de la communauté grecque et ses fervents efforts pour offrir de meilleurs services aux autistes. M. Katalifos a été directeur des écoles primaires Pierre de Coubertin et Général Vanier à Saint-Léonard, ainsi que directeur adjoint de l’école primaire Gardenview à Saint-Laurent et de l’école secondaire Westmount. Il a enseigné à l’Académie LaurenHill et a œuvré comme agent de liaison à la Division de l’éducation multiculturelle et multiraciale des Services aux communautés. À titre de président de l’école À pas de géant et du Centre de ressources, M. Katalifos participe à leur projet de villes inclusives. Nous vous invitons à consulter le communiqué. PRIX HSBC POUR UN ÉLÈVE DE ST. DOROTHY: Angelo Varuzza, élève à l’école primaire St. Dorothy à Saint-Michel, a remporté récemment le prix HSBC Future Leaders. Son école et le Club des petits déjeuners du Canada avaient présenté sa candidature. La Banque HSBC a versé 1 million de dollars depuis trois ans au profit des programmes de déjeuner dans cinq villes au Canada. Angelo figure parmi les sept lauréats au pays à s’être mérité une trousse de reconnaissance pour l’appuyer dans ses études. Une somme de 1 000 $ a été déposée dans un compte d’épargne à intérêt élevé HSBC à son nom et il a également remporté un voyage à Toronto, toutes dépenses payées, pour assister à une conférence où Chris Hadfield était le conférencier invité. La directrice Sandra Léveillé a déclaré qu’Angelo a été sélectionné parce que ses contributions ont eu une incidence positive tant dans son milieu scolaire qu’au sein de la communauté de Montréal-Nord. À l’école, Angelo se montre bienveillant. Il se porte souvent bénévole pour aider ses enseignants à la récréation, dans la classe ou ailleurs dans l’école. Il donne également de son temps à la boulangerie de ses parents à Montréal-Nord en y effectuant des corvées quotidiennes. De plus, il participe à la préparation de repas pour les itinérants de son quartier. Marco DeCrescentis, éducateur en services de garde, a soumis la candidature d’Angelo. ON NE JOUE PAS AVEC LES DROITS: Le programme B.A.S.E. des services de garde et le service d’animation spirituelle de la CSEM ont récemment remporté le prix Play it Fair décerné par le Centre international Equitas d’éducation aux droits humains. Tous les ans, Equitas remet un prix à un organisme, une école ou une municipalité au Canada qui contribue à l’avancement de l’éducation en matière des droits de l’homme. Cet honneur coïncide avec la Journée nationale de l’enfant en novembre. La CSEM a été sélectionnée pour son programme Supporting Children as Leaders Through Play it Fair! qui est offert dans 14 services de garde B.A.S.E. et auquel participent plus de 160 élèves du secondaire par l’entremise du service d’animation de vie spirituelle et d’engagement communautaire. Voici quelques-unes des activités proposées dans les écoles de la CSEM : des vidéos et bandes-annonces qui illustrent à quoi ressemblent des endroits respectueux et sécuritaires, une exposition photographique sur les droits des enfants, des murales dans les écoles pour accueillir les enfants, un livre d’histoire sur l’environnement et des jeux sur la prévention de l’intimidation. Nous vous invitons à consulter le communiqué. CENTRE MACKAY: La construction des installations ultramodernes du Centre Mackay et de l’école Philip E. Layton va bon train sur la rue Terrebonne, entre les avenues Benny et Madison, à NDG. La CSEM est propriétaire du terrain depuis des dizaines d’années, mais il était sous la responsabilité de la Ville et utilisé comme terrain de jeu informel par la communauté et l’école primaire Marc-Favreau de la Commission scolaire de Montréal (CSDM) qui se trouve à proximité. À l’heure actuelle, la construction est complétée à environ 30 % et les travaux lourds sont presque terminés. Les infrastructures souterraines sont en place et la structure du bâtiment a été érigée. La fermeture des murs extérieurs, l’installation des panneaux de béton préfabriqués et des murs-rideaux seront bientôt finalisées. À l’intérieur, 80 % des dalles de béton sont en place, et le tout sera complété au début janvier. Les travaux d’électricité, de plomberie, de conduits de ventilation et les murs intérieurs sont en cours, principalement au rez-de-chaussée et à l’étage. Les canalisations d’évacuation à l’extérieur du bâtiment sont partiellement terminées et devraient être complétées au printemps. Les travaux à l’intérieur se dérouleront tout au long de l’hiver, et l’aménagement paysager débutera tôt au printemps. Sur la toiture, l’installation des murets de séparation, des parapets et des membranes est en cours. La pose des pare-vapeur, de l’isolant et l’imperméabilisation auront lieu à la fin de janvier. Le bâtiment accueillera quelque 200 élèves ayant des troubles du développement, ou une déficience visuelle, auditive ou intellectuelle. Ce sera la seule école à offrir des services d’adaptation scolaire et de réadaptation à la communauté anglophone au Québec et tous les élèves des neuf commissions scolaires anglophones du Québec y auront accès. Certains d’entre eux devront consacrer jusqu’à trois heures par jour au transport scolaire. BOURSES KAYLA SEGAL: L’école primaire Sinclair Laird dans Parc-Extension et l’école primaire Cedarcrest à Saint-Laurent sont les toutes premières récipiendaires de la Bourse Kayla Segal pour le sport et le mieux-être. Chacune a reçu une somme de 875 $ qui servira à aider les élèves à adopter un style de vie plus actif. Par ailleurs, Kayla a recueilli pour l’école secondaire Venture à Ville-Émard des maillots de bain, des lunettes de natation, des casques de bain, quelques sacs de sport et planches de natation, ainsi que des palmes. Cet équipement sera utilisé dans la piscine située à côté de l’école. Les élèves n’en ont pas encore profité parce que plusieurs d’entre eux n’avaient pas les articles nécessaires, faute de moyens pour se les procurer. Ils sont très emballés à l’idée d’aller se baigner! Madame Segal est conseillère en sécurité financière et propose à ses clients des solutions optimales en matière d’assurance vie, santé et invalidité. Toutefois, sa véritable passion c’est de participer à des marathons et triathlons aux quatre coins du monde. Dans le but d’appuyer les programmes axés sur la santé et le mieux-être à la CSEM, elle a lancé une initiative visant à octroyer des bourses à deux écoles. Elle a organisé diverses activités de financement en vue d’amasser ces fonds et tient à remercier pour leur appui tout ceux et celles qui y ont pris part. L’école Sinclair Laird compte utiliser cette somme pour créer un programme d’initiation au patinage. L’enseignant d’éducation physique et de santé, Scott Danovitch, a indiqué que l’école fera l’achat de patins et de casques destinés aux élèves de 4e et 5e années. La plupart de nos élèves n’ont pas la chance d’être exposés au patinage, une activité susceptible de contribuer à l’amélioration de leur mode de vie. Ils patineront à l’Aréna Howie Morenz situé à proximité de l’école. Des cours de patinage hebdomadaires seront organisés pendant les heures de cours. Ils se dérouleront sur une période de 6 à 8 semaines, à raison d’un petit groupe composé de 10 à 12 élèves à la fois, jusqu’à ce que tous les élèves de ces deux niveaux aient eu leur tour. Une visite à l’école Cedarcrest est prévue après les Fêtes. CAMPAGNE ANNUELLE SPIRIT OF GIVING: À l’approche des Fêtes, la CSEM a fait équipe de nouveau avec les Forces armées canadiennes afin d’appuyer la campagne annuelle Spirit of Giving de CTV Montréal dont la mission vise à venir en aide aux plus démunis de la région de Montréal. Plus de 40 écoles et centres ont participé à cette campagne, de même que certains organismes communautaires. L’école secondaire Lester B. Pearson à Montréal-Nord ainsi que l’Académie LaurenHill à Saint-Laurent ont servi de dépôts et de quartiers généraux pour la campagne. Bon nombre d’écoles participantes de la CSEM ont organisé une série d’activités en vue de recueillir des dons. En outre, certaines écoles ont été à l’honneur dans le cadre des bulletins de nouvelles de CTV Montréal diffusés en après-midi et en soirée tout au long de cette campagne. La campagne, qui a débuté avec une émission diffusée en direct de l'Académie LaurenHill (https://vimeo.com/246271995) le mercredi 6 décembre, s’est conclue avec une autre émission, cette fois-ci en direct de l’école secondaire Lester B. Pearson le jeudi 14 décembre. Les autres écoles ayant participé à ces bulletins de nouvelles sont Roslyn à Westmount (https://vimeo.com/246502799), Coronation à Côte-des-Neiges (https://vimeo.com/246451506), Gerald McShane à Montréal-Nord (https://vimeo.com/246976533) et Michelangelo à RDP (https://vimeo.com/247148397). ACTIVITÉ DANCE FOR ALEX: Alex Porter-Rozmovits était un brillant petit garçon de six ans, affectueux et épanoui, qui fréquentait la maternelle de l’école Royal Vale. Il est décédé subitement le 22 juin 2009 des suites d’une rare infection bactérienne. Ses parents et ses sœurs Abby et Olivia pensent à lui tous les jours. L'enseignante madame Yasmine avait remarqué combien il aimait danser avec ses amis et avec elle. Depuis 2010, l’école Royal Vale organise l’activité « Dance for Alex » en sa mémoire. Chaque année, en décembre, des élèves, enseignants et parents d’écoles primaires se réunissent dans le gymnase afin de danser et de se remémorer Alex. Cette année, les parents d’Alex ont voulu redonner à la communauté. Ainsi, ils ont recueilli plus de 8 000 $ en l’honneur d’Alex et au profit de l’école Royal Vale et de la Fondation des Canadiens pour l’enfance. Les fonds amassés seront partagés également entre Royal Vale et la Fondation des Canadiens pour l’enfance. Chris Nilan, ex-joueur des Canadiens de Montréal et animateur de l’émission de radio TSN 690, a pris part à la collecte de fonds Dance for Alex. Il s’est adressé aux élèves, a signé des autographes et y est même allé de quelques pas de danse. DES BAS EN CADEAU: Félicitations aux élèves de l’école secondaire Rosemont et de l’école primaire Nesbitt à Rosemont, ainsi qu’aux élèves de l’école primaire Dalkeith à Anjou qui ont amassé 4 500 paires de bas qu’ils ont remis à des refuges pour sans-abri dans la région de Montréal. LA TOURNÉE DE LLOYD BARKER: Ex-joueur le plus utile de l’Impact de Montréal, joueur étoile de la ligue et ancien entraîneur-adjoint, Lloyd Barker visite des écoles à titre de conférencier motivateur. Ses exposés s’adressent aux élèves âgés de huit ans et plus. Ses présentations portent à la fois sur des thèmes de motivation (persévérance, appréciation, leçons de vie), sur l’importance de ne pas abandonner l’école, de même que sur l’entraînement et le bien-être. La durée de la présentation est de 60 à 75 minutes, suivie d’une séance d’autographes. Il suggère aux écoles de regrouper les groupes dans le gymnase pour la présentation. Il anime les présentations en matinée, de préférence. Il est à noter que la présentation de M. Barker s’apparente à celle qu’il a animée pour l’Impact de Montréal lorsque le club a procédé au lancement de son programme de persévérance scolaire en 2006. Il en fut le principal conférencier pendant six ans. Ce programme a remporté un franc succès. Il offre ses services à titre gratuit. En retour, il demande simplement à l’école de lui permettre de distribuer aux élèves présents des dépliants de sa nouvelle académie de soccer. La carrière professionnelle de Lloyd a débuté dès l’âge de 17 ans lorsqu’il a signé son premier contrat professionnel avec l’Intrepid d’Ottawa de la Ligue canadienne de soccer (LCS). En plus de jouer pour l’équipe nationale de la Jamaïque, Lloyd a joué dix saisons avec l’Impact de Montréal. Depuis, il a été impliqué dans ce sport à tous les niveaux en Amérique du Nord et est aujourd’hui reconnu comme l’un des grands du soccer au Canada. Fort de sa longue carrière comme joueur, entraîneur et commentateur, il possède une vaste expertise peu commune au Canada. Jusqu’à présent, il a été accueilli chaleureusement dans deux écoles primaires : Roslyn à Westmount et Honoré Mercier à Saint-Léonard. Pour en savoir davantage sur son académie, visitez le www.best11academy.com. Vous pouvez communiquer avec Lloyd par courrier électronique à lloydbarker11@yahoo.com. CPAC ROUTE 338: CPAC, la chaîne télé d’affaires publiques, a lancé une nouvelle initiative de littératie. CPAC Route 338 est une ressource novatrice qui propose un voyage virtuel au Canada pour permettre aux utilisateurs d’Internet d’en apprendre davantage sur notre histoire politique, le fonctionnement du Parlement, le rôle des représentants ainsi que l’importance de la participation politique des citoyens. Ce projet de littératie démocratique comporte trois volets : le site Web Route 338, qui dresse le portrait des 338 circonscriptions fédérales au Canada par l’entremise de photos, faits saillants et vidéos tirés provenant des archives de la CPAC; une série de cartes-tapis géantes illustrant les 338 circonscriptions canadiennes, conçues en partenariat avec la Société géographique royale du Canada; de même qu’une série de 11 activités pédagogiques liées au programme scolaire qui familiariseront les élèves du niveau primaire jusqu’au niveau supérieur avec les multiples facettes de la société démocratique. Voici le lien pour visiter le site Web : Route 338. Les enseignants peuvent emprunter la carte-tapis géante à l’adresse suivante : education.canadiangeographic.ca. UN NOUVEAU CENTRE: La CSEM a célébré l’ouverture d’un nouveau centre de formation professionnelle spécialisé en soudure-montage et en mécanique automobile. La cérémonie d’inauguration a eu lieu le 3 novembre à Saint-Léonard. La présidente de la CSEM Angela Mancini a tenu à souligner la vision et l’engagement des professionnels des Services de l’éducation des adultes et de la formation professionnelle à offrir aux élèves la meilleure formation professionnelle qui soit. 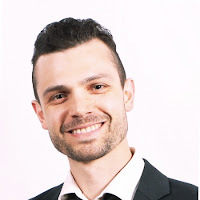 Ces professionnels de la CSEM qui ont contribué à la réalisation de ce projet échelonné sur deux années sont : Cosmo Della Rocca, directeur régional – Services de l’éducation des adultes et de la formation professionnelle; Daniel Hogue, directeur du Service des ressources matérielles et gestionnaire de projet; Mario Argiropoulos, directeur adjoint – Formation professionnelle, qui a joué un rôle de premier plan en tant que gestionnaire adjoint du projet; Lino Buttino, directeur du Centre de formation professionnelle Laurier Macdonald; Harry Michalopoulos, directeur du Centre de technologie de Rosemont; Sulaman Khan, directeur adjoint du nouveau centre des Grandes-Prairies; Frank Di Tirro, enseignant et coordonnateur du programme de mécanique automobile; et Robert Martin, enseignant pour le programme de soudure-montage. Parmi les hauts responsables ayant assisté à la cérémonie, mentionnons : Sylvia Lo Bianco, vice-présidente et commissaire dans Ahuntsic et Montréal-Nord; Me Patricia Lattanzio, conseillère municipale et commissaire dans Saint-Léonard; Rosario Ortona, président du comité consultatif SÉAPF et commissaire dans Anjou, Mercier, Hochelaga-Maisonneuve, Rosemont-La Petite-Patrie; Me Joe Ortona, commissaire dans Rivière-des-Prairies, Pointe-aux-Trembles; Mordecai Antal, commissaire dans Côte-des-Neiges, Snowdon, Outremont, Mont-Royal, Parc-Extension; Joseph Lalla, commissaire dans Montréal-Ouest, Notre-Dame-de-Grâce; Julien Feldman, commissaire dans Westmount, Sud-Ouest, Ville-Marie Ouest; Bernard Praw, commissaire dans Hampstead, Côte Saint-Luc; James Kromida, commissaire dans Saint-Laurent; Agostino Cannavino, commissaire dans Saint-Michel, Villeray, Plateau Mont-Royal, Ville-Marie Est; Mario Bentrovato, commissaire-parent, écoles secondaires; Joanne Charron, commissaire-parent, ACSAQ; Norm Gharibian, commissaire-parent; Jason Trudeau, commissaire-parent, écoles primaires; Lisa Christensen, conseillère municipale dans Rivière-des-Prairies; la directrice générale de la CSEM Ann Marie Matheson; le directeur général adjoint Benoît Duhême ainsi que les directrices régionales Pela Nickoletopoulos et Evelyn Alfonsi. Nous vous invitons à lire l’intégral du communiqué : http://www.emsb.qc.ca/emsb_en/media_en/onepressrelease.asp?id=4047. CENTRE DES ADULTES JFK: Le Centre d’éducation des adultes John F. Kennedy à Saint-Michel a enrichi son curriculum de cours optionnels uniques fort intéressants. Outre les cours traditionnels qui y sont offerts – anglais; français, langue seconde; mathématiques; sciences et histoire –, la directrice Elizabeth Lagodich et la directrice adjointe Darlene Kehyayan s’efforcent de faire de l’enseignement une expérience holistique et solidaire au sein d’un environnement propice à la réussite des élèves. Elles préconisent une approche personnalisée face aux difficultés rencontrées et font en sorte que les élèves restent centrés sur l’école et sur eux-mêmes. Cet automne, un cours d’éducation a été organisé en plein air. Accroître la résilience aide les élèves à trouver un équilibre dans leur vie. Les nouveaux ateliers de méditation et de pleine conscience permettent aux élèves d’explorer la prise de conscience de soi qui contribue à enrichir leur expérience d’apprentissage. Ils peuvent choisir des cours d’animation en 3D, Photoshop, Excel et acquérir d’autres aptitudes grâce à des cours dispensés dans le laboratoire informatique. Des services de tutorat sont offerts sur place pour les matières suivantes : français, mathématiques et sciences. Le Centre d’éducation des adultes John F. Kennedy est fier de ses élèves des services d’intégration sociale (SIS). Au nombre des cours offerts à ces élèves figurent : la zoothérapie, avec un chien certifié de l’Ambulance Saint-Jean, ainsi que la musicothérapie. Un nouveau concept « Just for Knowledge » (TED Talk) verra le jour en 2018. Pour de plus amples renseignements au sujet de l’école, visitez le http://www.jfkac.ca ou composez le 514 374-2888. The next Focus will be published on January 26. Submissions should be made to Michael J. Cohen preferably by e-mail (mcohen@emsb.qc.ca) by January 19 at Noon.